£30,000 below HR value. Stuart & Stuart are proud to present this extended four/five-bedroom detached bungalow which is enveloped by vast private gardens and extensive private parking, offering an exceptionally flexible family home at the heart of desirable West Linton. The front door opens into a good-sized hall that accommodates two well-proportioned double bedrooms with built in wardrobes; a versatile single bedroom that is currently used as a home office/study; and a three-piece family bathroom with an electric wall-mounted shower. The hall also leads into the large living room/dining room, which boasts an inviting open fireplace and in tur n flows into the dual-aspect conservatory and the well-appointed galley kitchen. Bathed in light from dual-aspect windows and a glazed door to the garden, the space is equipped with ample fitted storage and workspace, plus an integrated electric hob, an extractor hood and an electric fan oven. The kitchen is supplemented with a separate utility room, which offers additional fitted storage, space for freestanding appliances and a second door to the garden. 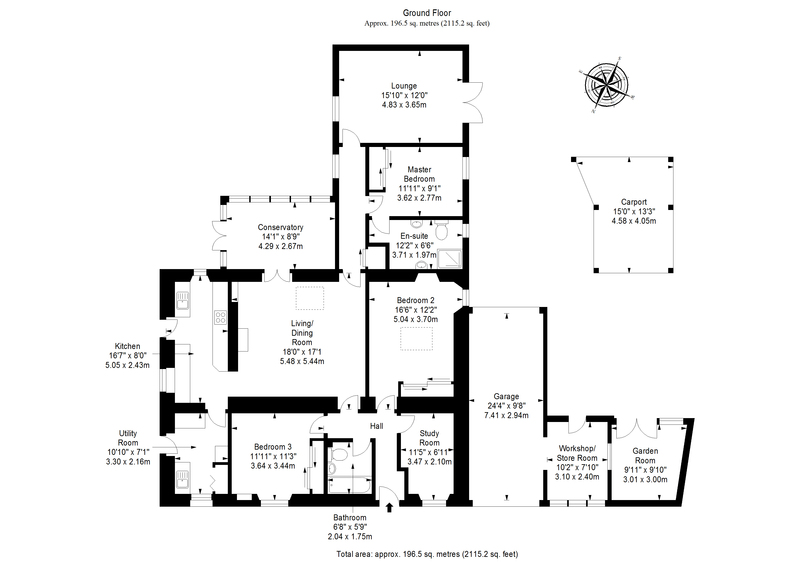 Returning to the living/diningroom and continuing into the rear extension, leading off the hallway is a master bedroom with fitted wardrobes and an en-suite shower room; a dual aspect lounge (or fourth double bedroom) with patio doors onto the garden; and a useful hall cupboard. The property benefits from oil-fired central heating and double glazing throughout, ensuring year-round comfort and efficiency. The bungalow is enveloped by beautiful landscaped gardens to the south, east and west; the vast plot also accommodates an extra large single garage with an adjoining workshop/store room; a multi-purpose garden room; a single carport with a vehicle inspection pit and a substantial driveway with space for at least four vehicles.